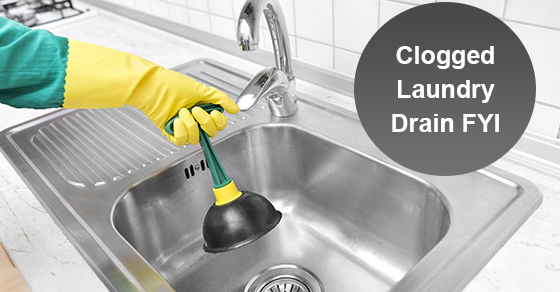 Here is everything you should know about clogged laundry drains. First of all, if water leaks onto your floor during the draining process, this is more than likely because of a clogged drain. The water used during a laundry cycle enters the machine’s sewage system via the drain hose, which can be several inches in length to a couple feet. When a buildup of debris (such as lint) enters the drain hose, a clog can occur and prevent water from properly draining. Find the drain hose (it may be under or behind your washing machine – consult your manual) and detach the hose with pliers via the metallic cylinder that connects the hose to the drain. Turn the pliers counterclockwise and then remove the hose from the washer. With a flashlight, locate the source of the clog. If you can’t find it, it is advisable to call a professional plumber. Otherwise, you can continue on with the following steps. If you can see the clog, the next step is to straighten a coat hanger and insert it into the hose to break up the clog. Lastly, rinse the inside of the drain with water. Use an unclogging solution according to the instructions. Take a plumber’s snake and push the coil’s tip into the drain until you reach the source of the clog. Next, you can use the handles to turn the snake in order to separate the blockage. For tougher clogs you may have to attach a drill to the plumber’s snake if you cannot remove the clog manually. Flush the pipe with water. If the plumbing snake does not resolve the problem, your pipe may be broken, in which case you will need to call a professional plumber. If you are in need of professional drain snaking services due to a clogged laundry drain, contact Brothers Plumbing today. We are one of Toronto’s leading plumbing providers with over 50 years in the industry. Our services are available at very affordable rates and at a time that is right for you. Our drain snaking services are among the best.